Northern Basement Systems has several different techniques that are designed specifically to help homeowners stop leaks in their foundation walls and concrete floors. Our company's experienced professionals provide patented, warranteed methods for repairing cracks in foundation walls. Our solutions provide affordable lasting results that are compatible with your perimeter drainage system and will not crumble, flake off your walls, or fail due to the natural expansion and shrinking of the concrete. 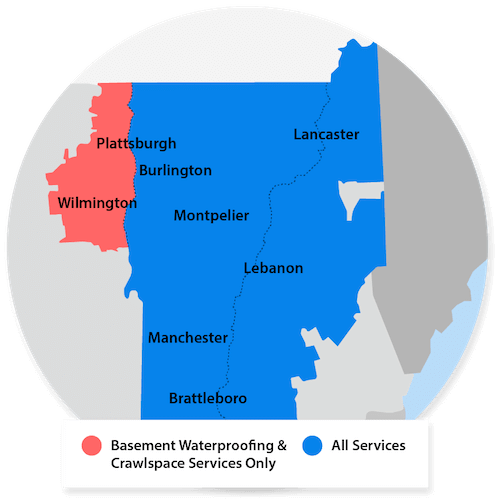 Our trained contractors service Vermont and New Hampshire, including Burlington, Keene, Colchester, Keene, Burlington, Colchester, as well as Laconia, Rutland, Bennington, South Burlington, St Albans, Montpelier, Brattleboro, Rutland, Laconia, South Burlington, Bennington, Brattleboro, St Albans, Montpelier, Lebanon, South Woodstock, Claremont, Concord, Milton, Berlin, Hanover and nearby areas. Contact us today for a free wall crack repair quote!